It matters little that the massive agreement between credit card giants Visa, MasterCard and large financial entities resulted in more than $6 billion in settlements, there are those who are saying it doesn’t go far enough and that retailers are still left with too big of a burden. And these folks are willing to go to court to prove their point. It was billed as the largest antitrust settlement in U.S. history, but despite that unpleasant connotation, for many of the beneficiaries, it is not nearly enough of anything, including money. Here’s what happened. A lawsuit was filed in 2005 and accused various financial companies, along with both Visa and MasterCard, of conspiring to ‘fix’ various credit card processing fees and swipe fees. The charges, according to the lawsuit, were excessively high and unfair. It took a few years, but a settlement was reached and it’s awaiting approval from a judge now. But there are those who say the judge should not only dismiss the agreement, but prepare for another court battle. As it stands now, approximately 7 million merchants will split $6 billion in damages. They will also receive a reduction in their fees for eight months after approval. These discounts are said to total more than $1 billion. Instead of closing the chapter, it’s instead pitted retail advocates against one another. On one side, there are those who are calling it a ‘hard won victory’ while those on the other side say it doesn’t go nearly far enough and can’t understand how it ever made it in front of a judge for approval. said Matthew Shay, president of the National Retail Federation, in a statement last month. Those who oppose the settlement say aside from the penalties and awards, nothing in the lawsuit puts into place compliance guidelines that will prevent the same thing from happening again. They say the credit card companies maintain the power to increase rate and fee structures with no oversight. But they’re also upset with the reality that they’ll no longer be able to sue again should the problem present itself again. That stipulation is one the credit card companies insisted were included before they would sign off on it. To be sure, the $7.2 billion award (damages and discounts) is impressive and makes the card networks look bad, say some insiders, but there are those who stand ready to remind anyone interested in hearing that there are more than 7 million plaintiffs and once everything is divvied up and the lawyers are paid, these merchants are ultimately left with less than two months of refunded fees – and with no assurances that they won’t be hit with higher fees again in the future. For now, the lawyers are hammering out other details associated with the settlement as they await the judge’s approval. That paperwork should be submitted no later than this week, which will wrap things up from the plaintiffs end and from there, all that’s needed is that one signature from a judge that will put the wheels in motion to end the suit. Any objections to the final deal will need to filed within thirty days. A final hearing is slated for December. The National Retail Federation, a merchant trade group, has already said it will attempt to block the approval. If it’s successful, this suit could result in what some are calling a “length trial”, something no one is looking forward to. Still, other groups including the National Grocers Association, the National Community Pharmacists Association and the National Association of Convenience Stores have also come out against the deal. Retailers such as Wal Mart and Target have a stake in this as well and have voice their own disapproval. It’s not clear whether these objections were made over the years as the process moved forward. Despite the growing support, one attorney for the plaintiffs is saying it’s still a small number who oppose the deal. Supporters, including Visa lead attorney Josh Floum says the settlement is both fair and reasonable and reiterated his confidence in it becoming final in the coming weeks. MasterCard representatives voiced similar confidences. Both credit card companies say there is a provision that enables retailers and merchants to impose a surcharge on transactions up to the amount it takes to approve transactions. Usually that’s around 2% of a sale’s total. That said, if those merchants opt to charge those fees, they must also apply the fees to networks like PayPal. So what is everyone so afraid of? It’s simple: this surcharge opens up the opportunity for retailers to secure lower rates from the card companies, which means smaller competitors will have a fighting chance to gain a bit of the market share. said one supporter. 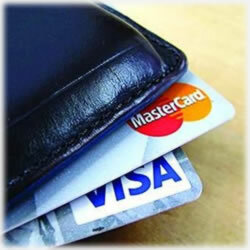 More importantly, this means the surcharges will benefit consumers if they prefer to pay wit cash. The retailers save processing fees and therefore, they’re in a better position to pass on those savings to Joe Consumer. The credit card companies doubt the consumers will see any added savings. It’s important to note, too, that in ten states, surcharges aren’t even legal. For those looking to put an end to this extensive lawsuit, the possibility of dragging it out is disheartening. “The same arguments have been debated and negotiated and mediated throughout the process”, said Trish Wexler, who is with the Electronic Payments Coalition. “Of course the retailers didn’t get everything they wanted,” she said. This is the best possible settlement that could have been negotiated by either side. What are your thoughts? Think you’ll see any benefits in the form of savings from this lawsuit? Let us know your opinion.